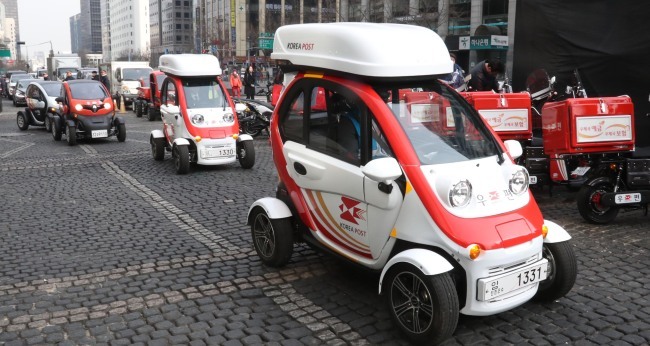 South Korea‘s postal service said Monday that it will replace 10,000 older model motorcycles with ultra-compact electric cars by 2020 as part of the country’s efforts to reduce fine dust. The plan is the centerpiece of a memorandum of understanding signed between the Ministry of Science and ICT and the Ministry of Environment earlier in the day. The Korea Post -- which is controlled by the Ministry of Science and ICT -- also plans to replace 50,000 old motorcycles with electric motorcycles by 2022, according to the initial agreement. “The MOU will serve as an opportunity to reduce fine dust emissions,” Yoo Young-min, minister of science and ICT, said in a signing ceremony near a main post office in central Seoul where Renault Samsung Motors‘s Twizy electric car and an electric motorcycle, called “Valencia,” were displayed. The Twizy produces no emissions and can travel up to 55 kilometers on a single charge, with its maximum speed reaching 80 km. It can be fully charged in three hours and 30 minutes.